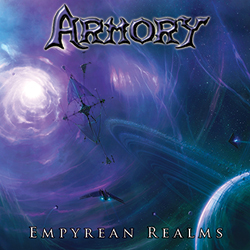 We are excited to announce that Armory’s new album, Empyrean Realms released in Japan and other Asian territories today on March 12, 2014 officially through Spiritual Beast! In addition to the nine original songs described as power metal with progressive and heavy metal elements, this Japanese edition of Empyrean Realms includes three cover songs as bonus tracks, including Riot’s “Thundersteel”, Helloween’s “Where the Rain Grows”, and Virgin Steele’s “Love is Pain”. Licensing Empyrean Realms in Japan is a major move toward increasing our international fan base. Armory and its label, Metavania Music went with Spiritual Beast for this opportunity because of their strong interest and belief in our music and because they have been specializing in licensing international melodic metal albums to promote in Japan for many years and were the label that released one of our own favorite albums, Hibria’s, Defying the Rules. Find out more about this Japanese Release of Empyrean Realms at Spiritual Beast’s website. Visit Armory’s official website for everything else and to get Armory merch, including CDs, shirts, posters, stickers, Fan Packs, and other combo deals. Thanks for the support!